Have you ever dreamed of working out your frustrations with a sledgehammer? 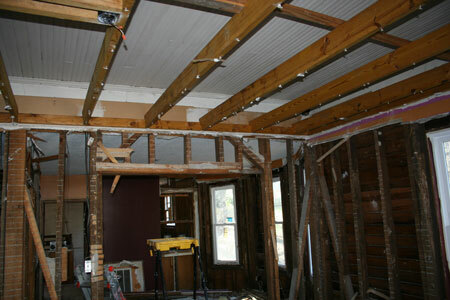 Well my husband and our handyman, Frank, did just that in our 1920s bungalow renovation project. First to go was that startling yellow-gold front room – down to the studs. 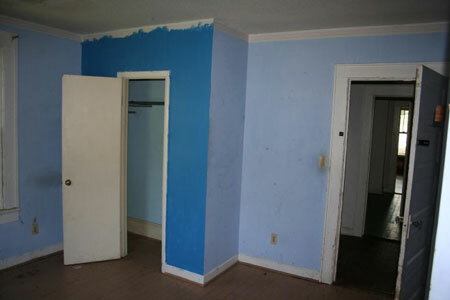 You can already see that the front bedroom in two shades of blue was next to go. 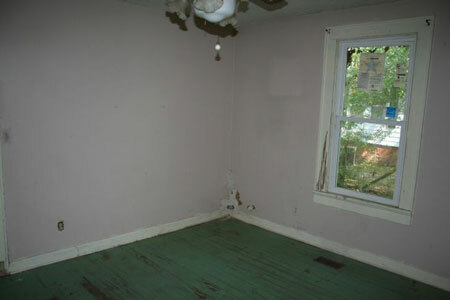 Remember the second bedroom with the seafoam green floor? Recognize it now? 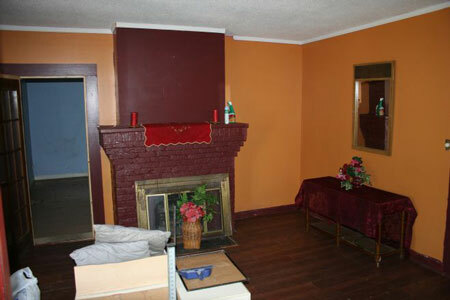 Beyond the fireplace, you can see the family room. 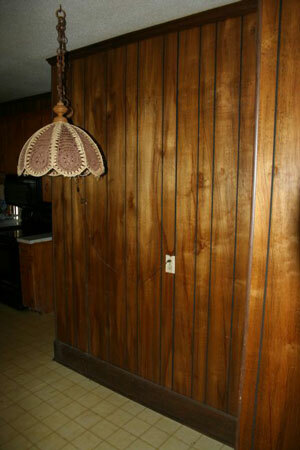 Here’s another shot with that ugly wood paneling on its way out. 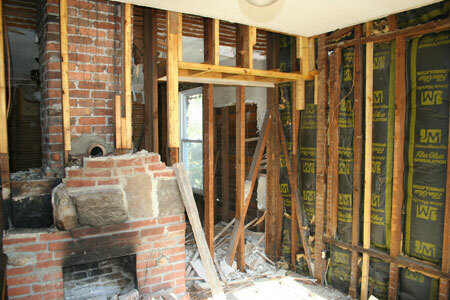 We had started deconstructing the whack-a-do fireplace in this photo. A look toward the kitchen and you’re starting to see what a big mess we’ve created! 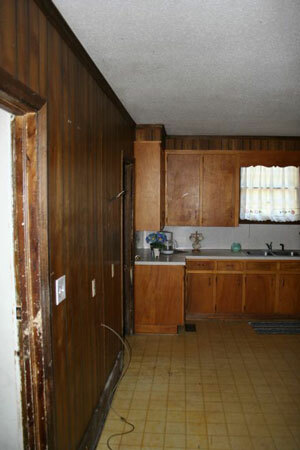 Nasty kitchen cabinets are gone – ugly wood paneling is next. 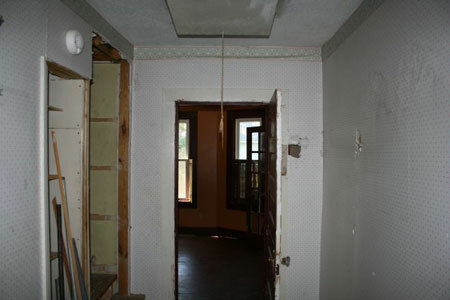 We were very excited to find that beneath the popcorn-textured drop-ceiling was the original 10 ft. high beadboard ceiling throughout the entire house! 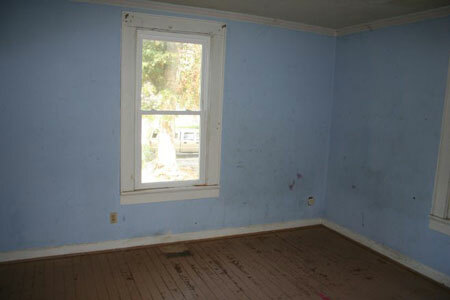 Here is a view of it in the dining room – it is in mostly very good shape with some areas of water damage in the front bedroom and family room that can be replaced. 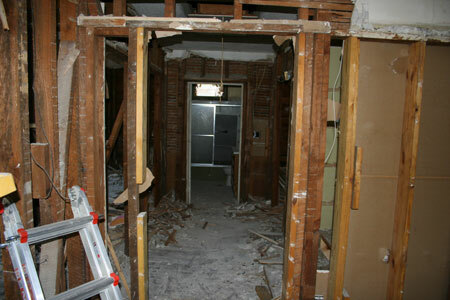 Out the front door, you can see the 10-yard construction dumpster that we used to get rid of all of the debris. Wow – what have we done? 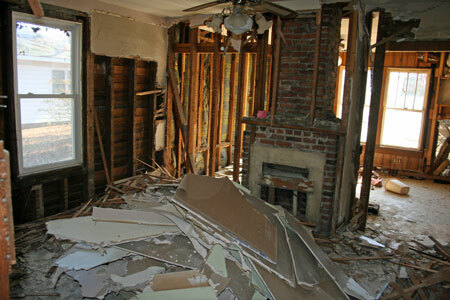 Can we re-build this disaster back into a home? The demolition phase took about two months and we filled up our 10 yard dumpster three times. Although we knew it needed to be done, we certainly wondered if we had reached a whole new level of crazy. Just in case you are a purist and are now furious with us about this demolition, we do not intend to do a historical restoration to our house. 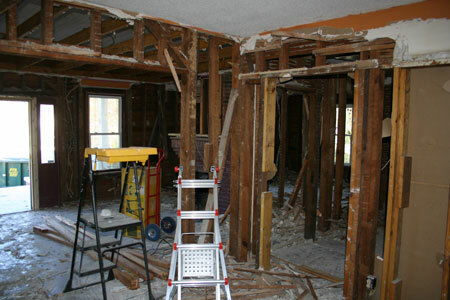 We are renovating and remodeling to make it more comfortable for us and to suit our lifestyle. However, we do love vintage and antique things and our home will reflect that. 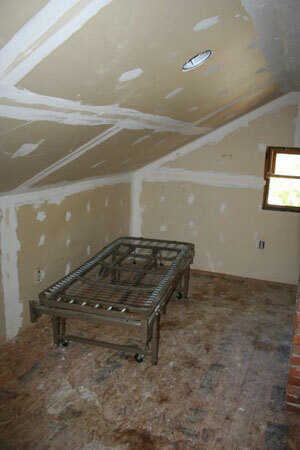 We will restore the original ceiling. We plan to use vintage cast-iron tubs in the bathrooms. 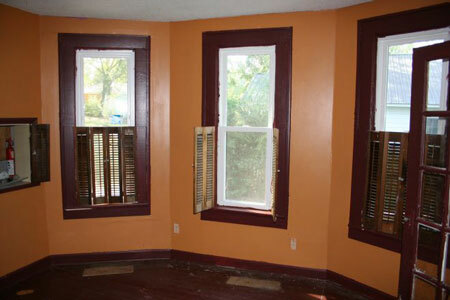 We’ll re-use the original doors, and re-purpose some of the original beadboard as wainscoting. And of course, there will be a great number of pieces of antique furniture and vintage accessories from our favorite resource for exceptional European and Asian Antiques – EuroLuxAntiques.com. So check back in to see what happens next! This entry was posted in Vintage Life: Our 1920s Bungalow and tagged 1920s bungalow remodel, Bungalow Renovation, old house renovation, Vintage Life on July 30, 2012 by euroluxantiques. 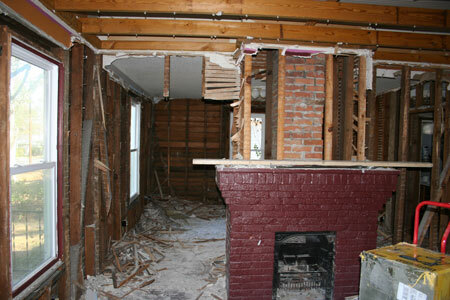 Thanks for joining me again as I show you around our 1920s bungalow renovation project. We’ve already seen the outside, and looked around inside in part one and part two. 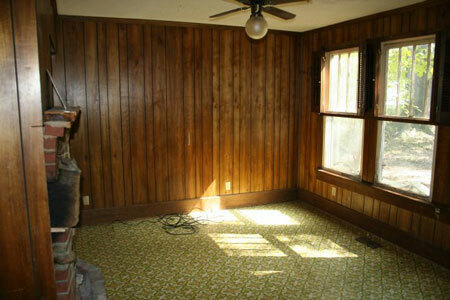 I left you standing in the family room with the outstanding avocado green and harvest gold patterned linoleum floor. We were about to head out that door to the left to see the utility room and garage, so let’s go. 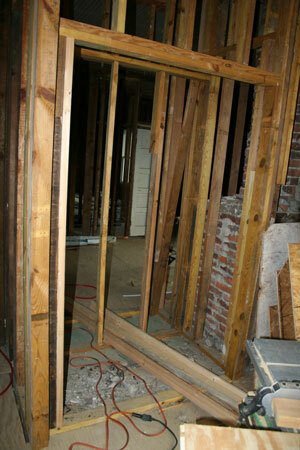 We believe this area was the original back porch of the house, as the walls are plank siding. It is possible this area may have been a bathroom, as bathrooms were commonly installed on the back porch of houses of this era. 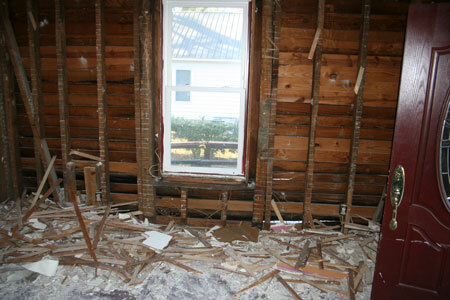 You’ve probably noticed the exposed wires running along the wall and the exposed plumbing. The whole house will need to be rewired for and re-plumbed for safety. 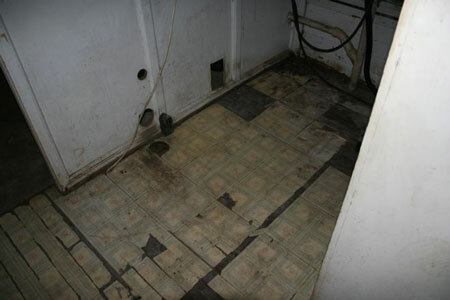 The floor is about to give way due to water damage and is quite moldy – don’t stomp your feet! 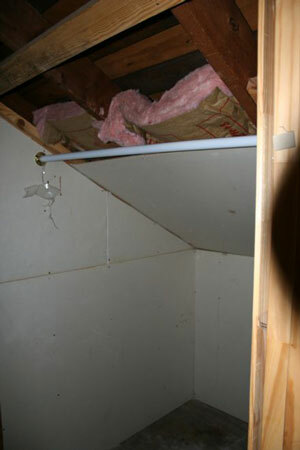 Continue through the door out to the garage and behold the black mold growing on the rafters. 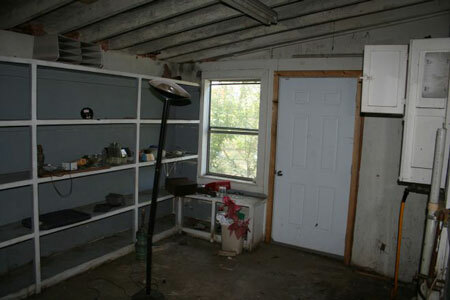 This garage was an addition that the prior owner (shoddily) built over a poured concrete floor. The door goes out to the driveway. The window looks back into the utility room. I really like that vintage blue enamel gamecock – I’m keeping him, but everything else out here has to go. 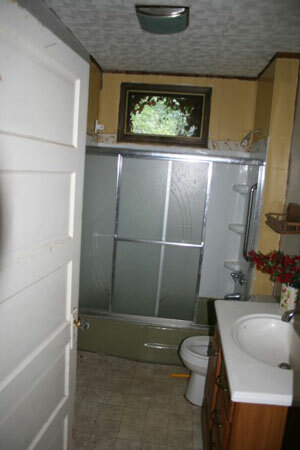 The door straight ahead goes out to a partially built bathroom that the prior owner never finished. Go back through the door to the left, through the utility room, kitchen, and dining room. I’ll meet you at the bottom of the stairs in the hallway. The prior owner started quite a few projects, but didn’t seem to finish very many of them. 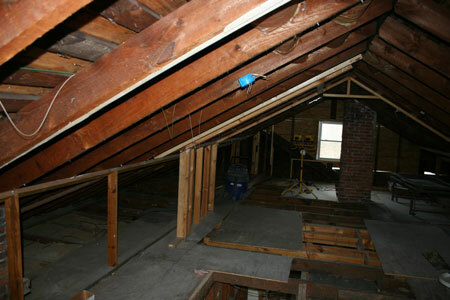 Converting the attic to livable space is a great idea, but it requires a staircase to get there. The prior owner knocked through the hallway and used the space in the second bedroom’s closet to get there – that’s the seafoam green floor of the second bedroom you see to the right of the stairs. 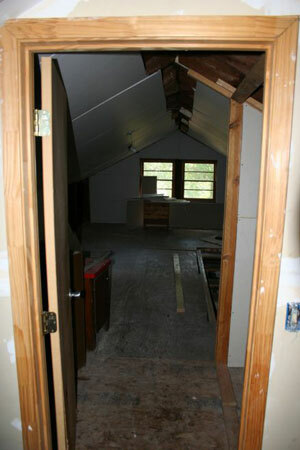 He didn’t finish, but the prior owner had started to build a bedroom in the far area of the attic and was planning to leave space for storage on either side of the main area. This room looks out over the front of the house to the front yard, and the brick fireplace goes right through the middle of the room. 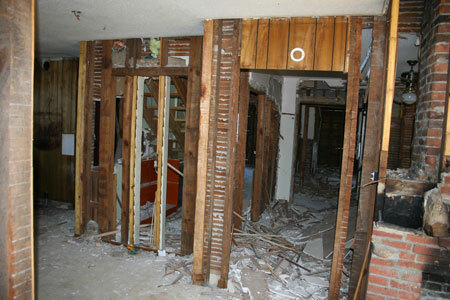 Looking back out toward the stairs, we can see that the prior owner wasn’t very adept at hanging drywall. Hmmm, what was he planning to do to about the ceiling? He also made a little closet next to the bedroom. 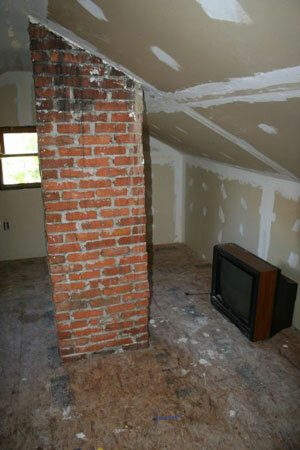 Unfortunately, he only used R17 insulation behind the drywall in the whole attic conversion project. 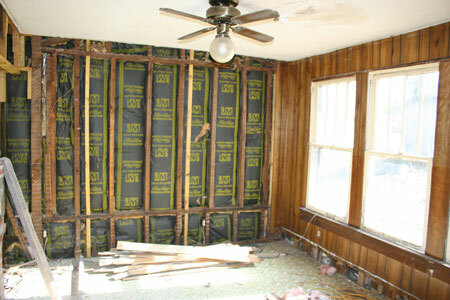 In a hot climate like South Carolina, we’ll need to use R35 or spray foam insulation to keep the heat out. 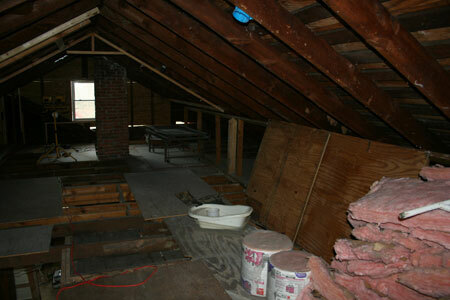 Although converting the attic to livable space is a wonderful feature, the work has been so poorly done that we’ll need to pull it all down and start over. Luckily the stairs are well-built and will stay. 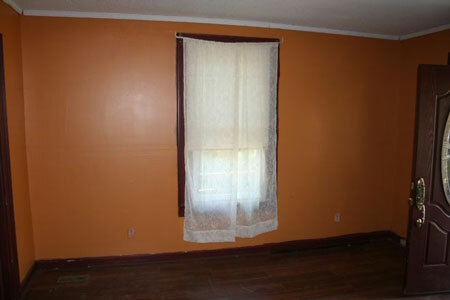 So now that you’ve seen the “before” photos – do you think we’re crazy? Be sure to stay tuned for the next blog post to see what happens next! This entry was posted in Vintage Life: Our 1920s Bungalow and tagged 1920s Bungalow, Bungalow Renovation, old house renovation on July 21, 2012 by euroluxantiques. So far I hope you’ve enjoyed the view of the outside and part one of the tour of the inside of our 1920s bungalow restoration project. If you recall, we left you in the second bedroom with the green floor at the end of part one. Now let’s walk back through the hallway away from the bathroom and past the stairs to the left. You are now in the original dining room, which is painted the same startling yellow-gold hue as the front room with dark burgundy paint on the window casings, moldings, and original pine floor. The room has an interesting hexagonal shape with three large windows. The door to the right goes to the yellow-gold front room. 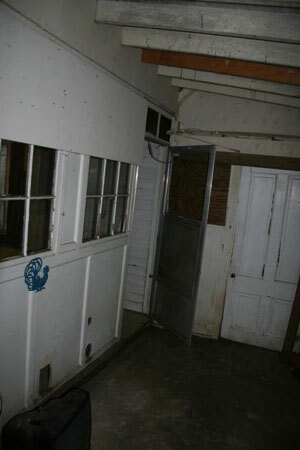 The windows look out over the dilapidated wheelchair ramp and driveway. 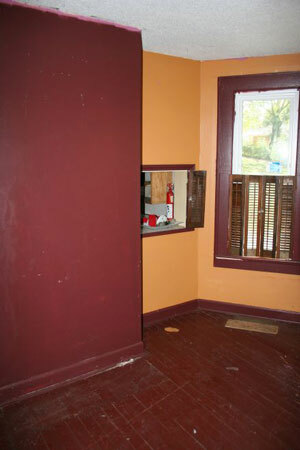 There is a pass-through window to the kitchen to the right of a burgundy wall, behind which is an original fireplace. 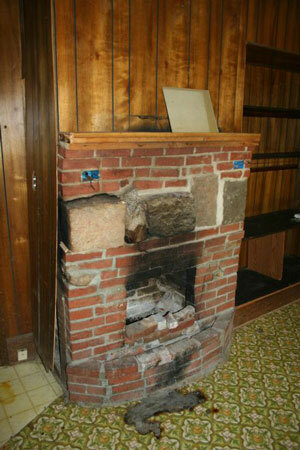 Now walk through the door to the left of that covered fireplace to reach the kitchen. 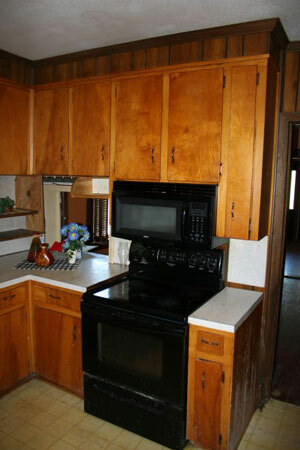 At first glance, the kitchen looks decent, but if you look closely, you’ll see white mold growing on the outside of the bottom cabinet to the right of the stove. This mold completely covers the inside of the cabinets. 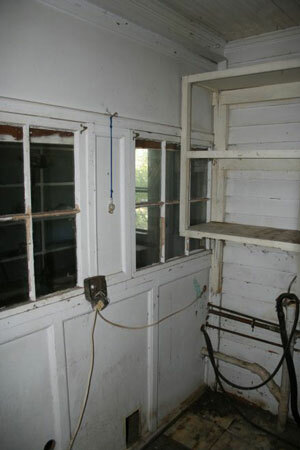 I’ll spare you a peak inside the cabinets, oven, and microwave – it is truly gag nasty. 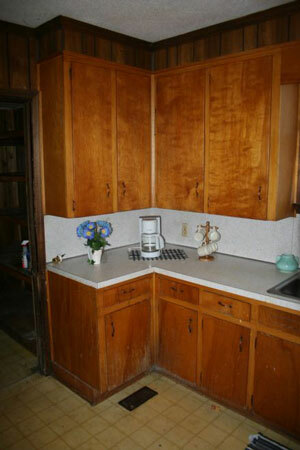 More white mold beginning to show on the outside of the lower kitchen cabinets – the door to the left is to a large pantry. Notice the original beadboard ceiling. That’s the stove you see at the back of the photo, while the space below the 1970s vintage chandelier was used as a dinette area. 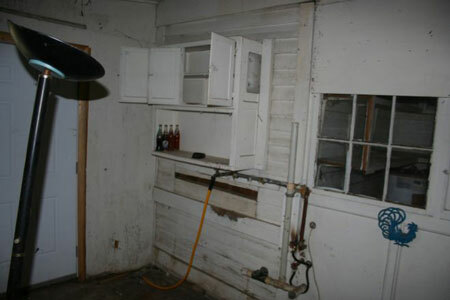 The refrigerator was on the long wall in the kitchen, with the far door to the left going to the pantry. 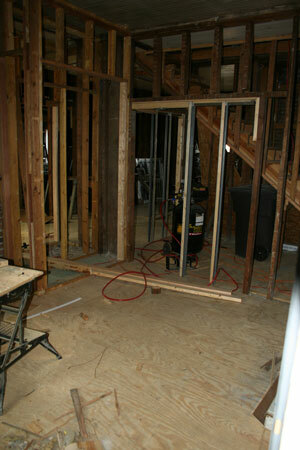 The door to the immediate left goes out to the utility room and garage, we’ll get to those. Turn around now and you’ll see the wood-paneled family room, with a view out to the back yard. I know you’re hoping we’ll be able to save that avocado green and harvest gold patterned linoleum floor. Oops, looks like there was a fire – not going to be able to save that linoleum floor after all. Turn back around and head out through the door on the left to the utility room and garage. Take a moment to notice the water damage on the ceiling to the left of the fan as you walk by. But that’s it for today. We’ll finish the house tour in the next blogpost with views of the utility room, garage, and the upstairs. This entry was posted in Vintage Life: Our 1920s Bungalow and tagged 1920s Bungalow, bungalow restoration, house renovation project, old house restoration, Vintage Life on July 21, 2012 by euroluxantiques. 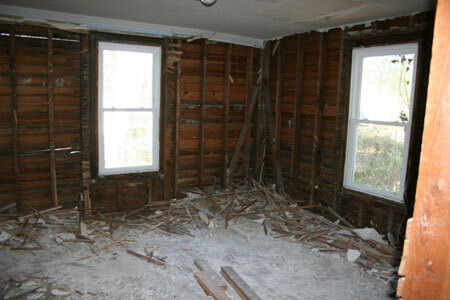 As I explained in an earlier blogpost, Greg and I purchased a 1920s bungalow last October that needed a little work. Okay, it needed a LOT of work. And while our family and friends thought the house had potential when we gave them a tour, pretty much everyone thought we were nuts to take on such a huge endeavor, especially in light of our busy schedule running EuroLuxAntiques.com. But Greg and I are a great team. We can accomplish a huge amount of work when we work together, so we were optimistic that we could tackle this challenge. I’ll take you on a tour through the inside of our disaster – come on through the front door. 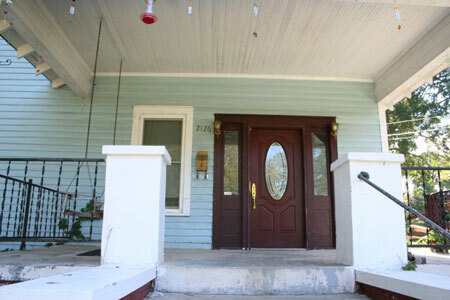 The front room is a startling shade of bright yellow-gold with dark burgundy trim on the window casings and the original brick fireplace – now you understand the prior owner’s choice of a dark burgundy front door. A wood laminate flooring covers the original floor. 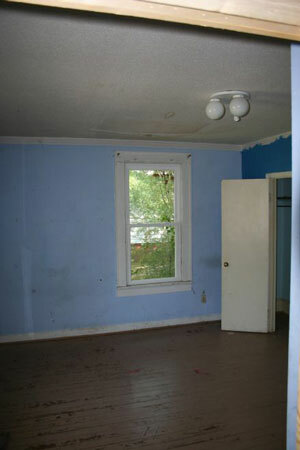 Walk through that doorway in the left corner of the front room and you’ll find the front bedroom, in two shades of blue. The original pine floors have been painted beige and there is a popcorn stucco on the ceiling, which reveals some water damage. To keep you oriented, you’re looking out the window to the front yard in the photo above, and then turning around and looking back through the door to the front yellow-gold room in the photo below. This doorway is not original and was created by the prior owner. 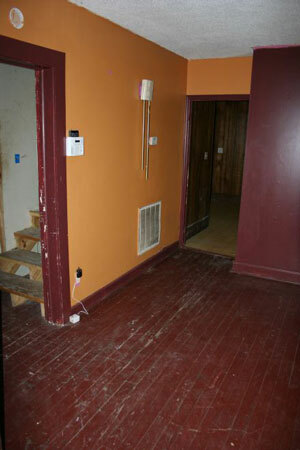 To the left of the doorway, the original fireplace (which is on the back side of the fireplace in the front room) has been covered over. Now turn to your left and head out the door to the right of the closet into the hallway. 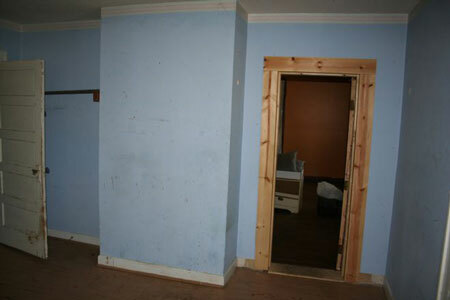 In the photo below, you are standing in the hallway and the door to the left is the blue bedroom that you’ve just left. Ahead is the lovely bathroom, and to the right is a second bedroom. 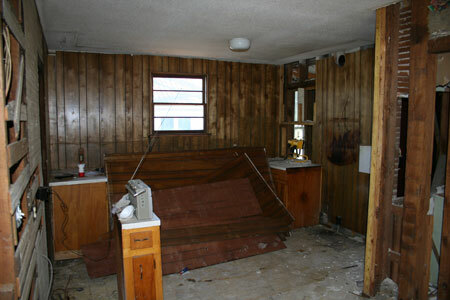 The photo below gives you a look into the bathroom. That linoleum is actually the third layer of bathroom floor, over a rotten subfloor – see the dip right in front of the tub? Stomp your foot there and you’re likely to fall through. And that’s the ivy that has covered the left side of the house that you’re seeing through the window. 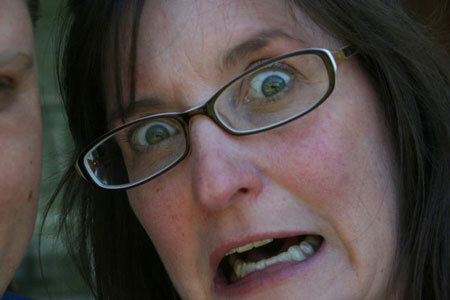 Now you’re standing in the door to the bathroom and have turned around to look back through the hallway. 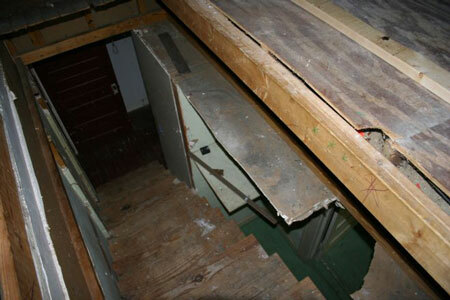 You’ll notice holes have been punched in the wall on the right and there appears to be a linen closet and then a staircase to the left. We’ll go upstairs later. 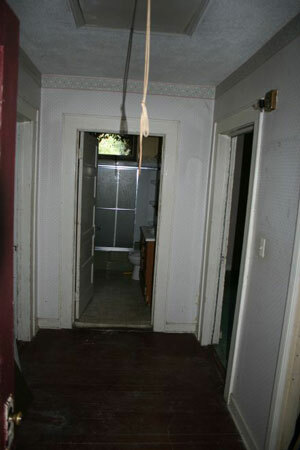 Now turn to your left and go through the doorway to the right of the bathroom into the second bedroom – notice the original glass door handle – many are still remaining on the doors throughout the house. 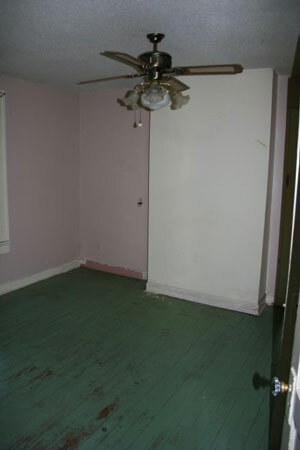 The original pine floor has been painted seafoam green while the walls are baby pink. 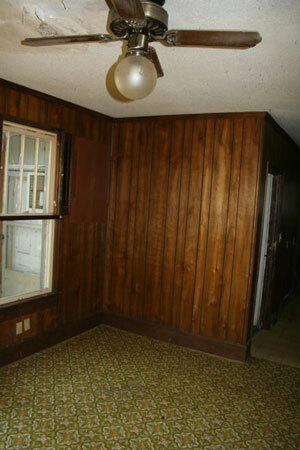 The jag in the wall directly behind the ceiling fan covers an original fireplace. In the corner of the room, an animal has tried to dig its way out. 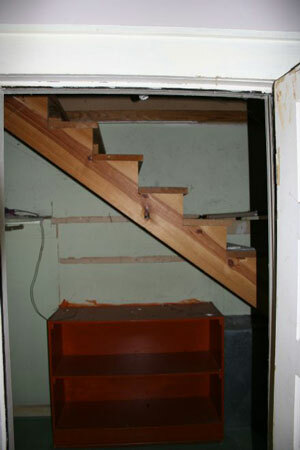 Looking into the closet, you see a stairway that is not original to the house. There is a door to the left of the closet that leads to the back of the house, but we’re going to save the rest of the house tour for the next blogpost. Tune in next week for more photos! This entry was posted in Vintage Life: Our 1920s Bungalow on July 21, 2012 by euroluxantiques.